The grizzly bear, also known as the North American brown bear, is aggressive, protective, and generally seclusive. If a grizzly bear feels endangered or provoked, it will stand its ground and fight. However, these bears do not seek out, nor purposely avoid humans. Bears have a personal space zone, which varies from animal to animal. As long as this zone isn't penetrated, the bear will virtually ignore any humans in close proximity. Grizzly bears are thought to have originated in Eurasia, crossing over from Russia to Alaska over 100,000 years ago. They can be found in Europe, Asia, and North America, but the majority of the population resides in western North America, including parts of Canada, Washington, Wyoming, Montana, Idaho and Alaska. They inhabit forest-filled mountain ranges teeming with rivers and streams. During the winter, they usually find a den or cave for hibernation. However, grizzly bears do not fall into a deep sleep and are quick to wake up if disturbed. Hikers and nature lovers should take care not to wake a sleeping grizzly. Standing at approximately five to eight feet and weighing anywhere from 200 to 800 pounds, grizzly bears are superior when it comes to foraging and finding food. They are omnivores with diverse diets, consisting of large and small mammals; varied types of fish, like salmon, bass, and trout; and plant life, such as blackberries, blueberries, whitebark pine nuts and grasses. They scavenge carcasses and are extremely resourceful with the provisions surrounding them. Although powerful enough to devour, grizzly bears do not consider humans to be a food source. 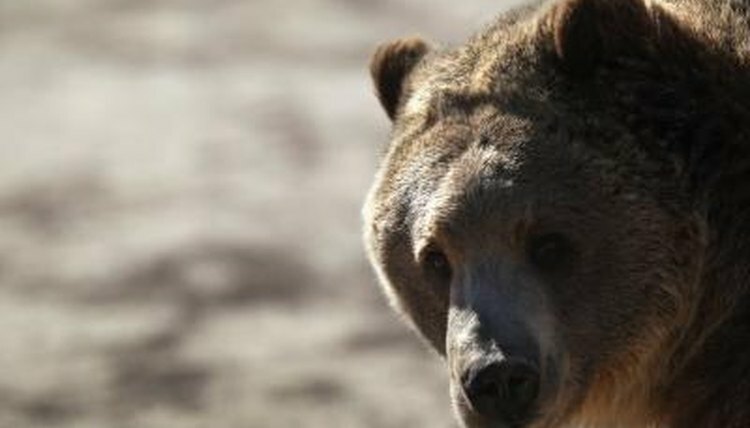 Grizzly bear mating begins in late May or June. Female bears, or sows, give birth to usually two cubs, in January or February, waking briefly from hibernation. When first born, grizzly bears are blind, covered in fur (unlike other bears), and usually only weigh about one pound. The mother bear fiercely protects her cubs and will fight any human that comes in close contact with her family. At approximately two years of age, bears must learn to take care of themselves. Most grizzly bears live to be about 25 years old. Grizzly bears adapt, hunt, and defend their way to survival, causing them to sometimes be easily aggravated when in contact with their natural predators, humans. Steps can be taken to help prevent encounters with these resilient beasts. Cooking food away from a camp site, avoiding dead carcasses and bear cubs, and traveling in large groups are helpful tips to preventing grizzly confrontations. In general, grizzlies will attack humans only if they feel their life is being threatened. Although grizzly bears do not necessarily avoid humans, they do not seek them out either.